Dr. Edward W. Younkins is a Professor of Accountancy and Business Administration at Wheeling Jesuit University in West Virginia. He is the author of Capitalism and Commerce. Plato (427-347 B.C.) held that the world is made up of two opposed dimensions – true reality (i.e., the intelligible) and the material world (i.e., the sensible). True reality is a set of universal ideas that are the "essential forms," "absolute essences," or "disembodied abstractions," which represent and contain all the qualities that the particular members of classes of material objects have in common. There is an absolute form, essence, or idea, which is the true nature and reality shared by particular members of a class. Ideas are nonmaterial existents in another dimension separate from man's mind and from any of their corporeal embodiments. Plato explains that sensible things of the world cannot be known with any certainty because they are in a continual state of impermanence and change. Objects of sense cannot be known for at the very instant the observer approaches they will have already changed. From this, he concluded that there is nothing real and stable in the sense world. Change is everywhere – things in the world are always transforming. Yet, change is contradictory and contradictions are unknowable and unintelligible. Plato surmises that the world of particulars is unknowable; yet, he is convinced that knowledge must be possible. For Plato, the Ideas that we contemplate always transcend the things of which we have sensible experience. These Universals are immutable, noncontradictory, eternal, have identity, and are knowable. Knowable implies real to Plato. Plato explains that we really never see "manness," we only see individual men. To be a man is never identical with the particular person whom we experience with our senses. Because individual men are simply particular manifestations of the Idea, manness, they are not actually real. All individual men are essentially the same Idea in a variety of instantiations. Individual men come and go but the essence of what it means to be a man stays the same. Plato argues that the existence of universal ideas in human minds demands the existence of a supramundane world of pure essences that are stable, real, and eternal. These Ideas exist as real entities apart from the world of sense. Plato argues that Universals are real and that they exist in another dimension of reality. This is the essence of Plato's two-world metaphysical and epistemological dualism. Plato says that we necessarily have to know the Universals first. (He failed to realize that we acquire our universal ideas from sensible objects via a process of abstraction.) Plato contends that only by already knowing the Universals can we group the particulars. For him, all knowledge is deduction. He alleges that men's souls must have had a preexistence in a former life in the world of Ideas. The soul knew these concepts before its entrapment in a physical body and can remember these Ideas when contact is made with actual things through the senses. When the soul encounters a copy of an Idea in the sense world, a process of reminiscence is set in motion, making a man curious and spurring him on in his efforts to know reality. The objects of sense are but faint changing imitations of the eternal, unchanging Ideas. "Because individual men are simply particular manifestations of the Idea, manness, they are not actually real. All individual men are essentially the same Idea in a variety of instantiations." Particulars are shadows or reflections of Universals that somehow participate in the Universals. Plato offers no literal explanation of participation. Somehow the Universals project out or shine forth into the emptiness of space thus casting shadows or reflections of themselves and causing the particulars of the sensible world to come into existence. According to Plato, the soul is born with knowledge that it forgets when it is imprisoned in the body. Knowledge is thus buried in the mind (or soul). Encounters with particulars activate the soul's knowledge of Universals. When one's memory is jolted, he is prompted to turn inward in order to look upward to find the Forms. True reality cannot be known by logic or reason, it can only be known through mystical experience (i.e., intuition and revelation). Plato maintains that the soul must have come from the world of Forms. This can be criticized on Plato's own terms. Whereas Forms are Universals, the soul is a particular. How can a particular soul exist in a world of Universals? Only "soulness" should be there. In addition, if the soul actually had a previous existence, shouldn't the awakening of the innate universal ideas revive the memory of the soul's previous existence itself? Plato observes that only a select few, who have been endowed with the innate capacity to contemplate, are able to master the path to true knowledge. The few who are attuned to true reality are by natural right the rulers of the vast majority of men. Plato calls for a benevolent despotism of the select few who are willing to live the life of the mind and to ignore the pleasures of the material world. Plato's metaphysical and epistemological dualism is also an ethical dualism of good and evil, right and wrong. There is a moral conflict between the world of the senses and the world of the intellect. To attain happiness one needs to turn away from the material world and its inclinations and instead attend to the contemplation of timeless, changeless Ideas. The soul, which understands that happiness consists in the world of Ideas, is never satisfied with the knowledge of inferior degrees. Because the higher world is better, it is moral to turn to the better world. The highest form of love, according to Plato, is the love of wisdom that is only found in the higher world of Forms beyond this world. It follows that the soul wants to escape from the bodily world to rise to the world of Forms to be with the highest degree of knowledge. Plato is thus espousing an otherworldly egoism – self-denial and sacrifice in this world in order to obtain salvation and the highest values in the higher world. Plato's Ideas are endowed with real existence in a world superior to the world that we see. It follows that the citizens of Plato's state should concern themselves with the transcendent world and not give in to the inclinations of sense and passion. Plato explains that not only should a man shun the pleasures of the sense world in the name of loyalty to a higher dimension, he should also deny his individuality in the name of unity with the collective. An individual man is just a particular shadow cast by the Universal manness. It follows that all men make up one unity and that no one person is an autonomous reality. In politics, this leads Plato to collectivism. The individual is simply a fragment, whereas the group (the collective) is a higher manifestation on earth of the Universal manness. It is closer to the whole. Collectivism is a higher and closer development toward the Universal manness. The individual is thus subservient to the group. Since the needs of the whole take precedence, the individual should put aside his own interests for the needs of the whole. This leads to Plato's advocacy of a life of self-sacrificial service to the community, the standard of value in society. Through his efforts to extinguish his own individuality, each person will become one with the community and live only to serve its welfare. 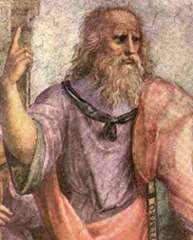 Plato's organic theory envisages an omnipotent state that is more real than the individuals who live within it. This state is to be ruled by a special elite of philosophers who have the ability to escape (as far as is possible in this world) the domain of sense experiences and rise to the contemplation of universal Ideas. For Plato, the criterion of morality is the interest of the state and the proper life is one of selflessness and renunciation. On earth you are to obey the state (i.e., the philosopher-kings) that teach you to eschew the bodily world and purify the soul through self-sacrifice. If you do this, then you are rewarded in the higher world – egoism is put off until then.